With SweatStop® antiperspirants, Functional Cosmetics Company Inc., headquartered in Basel, Switzerland, offers extensive solutions against excessive sweating. The range includes 12 products in various dosage forms and intensities for every individual need. Whether a roll-on against underarm perspiration, lotions for hands or the face or sprays for the back; there is a proper product against sweat and odor for any part of the body. SweatStop® antiperspirants are based on mineral salts, which are responsible for the significant effect against sweating. Thanks to the enrichment with skin-care additives such as aloe vera or panthenol the application is particularly gentle. 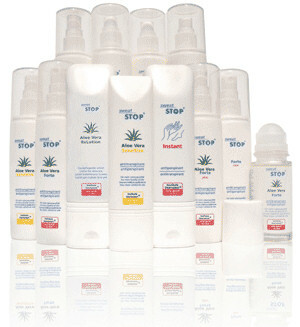 All SweatStop® products were dermatologically tested and rated as "very kind to the skin". SweatStop® antiperspirants are available in pharmacies in Germany, Austria or Switzerland or can be easily purchased directly from the manufacturer online. As a specialised manufacturer in this very specific niche, Functional Cosmetics Company Inc. provides not only excellent product solutions but also expertise all around the topic of perspiration. Offering first class service to achieve the highest possible customer satisfaction is our promise. Functional Cosmetics Company Inc. has it made its mission to considerably increase the quality of life of people from all over the world.